We are back this week with our series about the native trees of Chicago to discuss a tree that is unique in our Midwestern landscape, the birch tree. Birch trees are medium to large sized deciduous hardwood trees that are most notable for their lightly colored, paper-like bark. They are generally planted as shade trees, but the vibrant color of its leaves in the fall in contrast to its light-colored bark creates quite a sight, making birch trees excellent ornamental trees as well. Birch trees are found all over the world in the northern hemisphere including Europe, Asia, and North America. Of the 60 or so known species of birch trees, 15 species can be found throughout the northern U.S., including the Chicago area. Birch trees are a favorite tree to incorporate into landscape designs, but they are not good trees to put in difficult areas where they won’t get enough water or where they will be exposed to pollution. The biggest threat to birch trees is the bronze birch borer that attacks the trees from the inside out, feeding on the sapwood inside the tree in their larvae stage. Fortunately, healthy birch trees are rather resistant to the bronze birch borer as this insect generally attacks birches that are stressed due to drought conditions. Providing effective care for your birch trees will help them better resist the bronze birch borer and other insects and diseases. 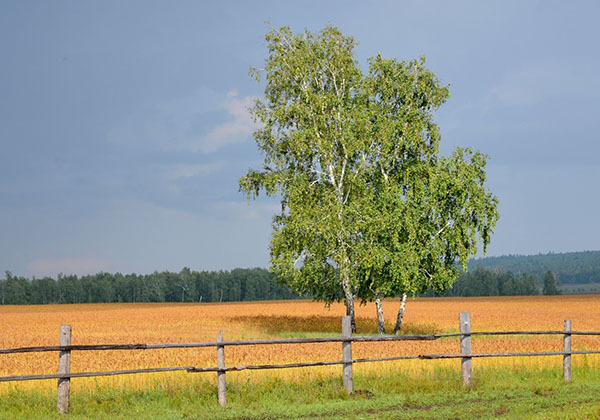 In this article, we will take a closer look at the various characteristics of birch trees, focusing on the species of birch native to the U.S. and the Chicago area. We will also cover the main threats to birch trees as well as proper care tips to keep your birch trees healthy and help them resist disease. If you need the help of professional arborists to provide care for your birch trees or treatments for insects or disease, contact Hendricksen Tree Care. Our arborists are ISA certified and ready to provide a range of tree care services in the north and northwest Chicago suburbs including fertilization, treatments, and tree trimming services. Birch trees are typically medium sized trees that can grow anywhere between 20 and 70 feet tall depending on the species. The leaves of most birch trees are small, oval-shaped leaves that grow in clusters, which is what makes them such excellent shade trees. The most distinctive feature of birch trees is the bark that is white or gray in color for most species. The paper birch (Betula papyrifera) in particular has whitish paper-like bark that easily peels off the trunk of the tree. Height: The height of a birch tree differs between species. Gray birch trees may only grow to be about 20-40 feet while paper birch trees can grow between 50 and 70 feet. Most species of birch are somewhere in between. 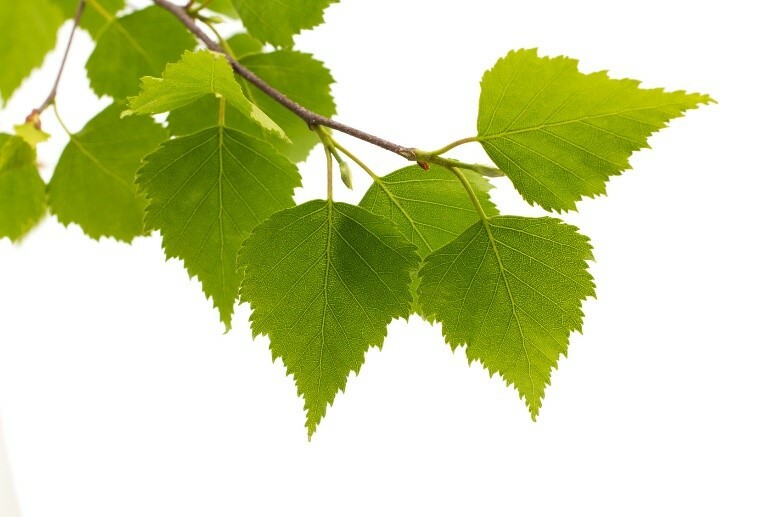 Leaves: Birch tree leaves are small oval-shaped or triangular-shaped leaves with serrated edges that grow in alternate patterns. They are typically dark green during the spring and summer and change to a golden yellow color in the fall. Flowers: Birch trees are monoecious which means both male and female flowers can be found on the same tree. The flowers are inconspicuous drooping catkins that are green in color. Fruit: The fruit produced by birch trees are cylindrical clusters or catkins of small, winged seeds. They are typically light green in color. 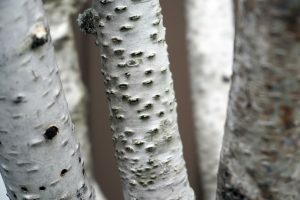 Bark: The bark of most birch trees is white or gray in color. The sweet birch is one exception as its bark is dark brown or black in color. Most birch trees start out with reddish-brown bark when they are young and it eventually becomes whitish in color. Paper birch trees have peeling bark while the bark on other species of birch generally does not peel. Yellow Birch: The yellow birch (Betula alleghaniensis), also known as the golden birch, is a medium sized tree that can live for up to 300 years in the wild. These trees are named for their yellowish bronze bark that has an outer layer that peels in strips. Yellow birch trees are very similar in appearance to sweet birches. Sweet Birch: The sweet birch tree (Betula lenta), also known as the cherry birch or black birch, has reddish brown bark that is smooth with white lenticels. The bark may become darker colored and scaly as the tree matures. Sweet birches are known for their sap and their leaves and stems smell like wintergreen when crushed. River Birch: The river birch (Betula nigra), or black birch or water birch, commonly grows in wet areas like swamps and floodplains. This birch is one of the few birch trees with a high tolerance for hot weather. River birches typically consist of multiple trunks and the bark changes significantly as the tree matures. River birch bark starts out pinkish gray in color with very loose paper scales. As the tree matures, the bark becomes a darker reddish brown or dark gray and the loose scales become thick plates. Paper Birch: The paper birch (Betula papyrifera), or white birch, is a locally native tree known for its white, paper-like bark. The bark of a paper birch will always peel very easily throughout its maturation and the bark develops black lenticels as it ages. Gray Birch: The gray birch (Betula populifolia) is a pyramidal tree named for its whitish gray bark. 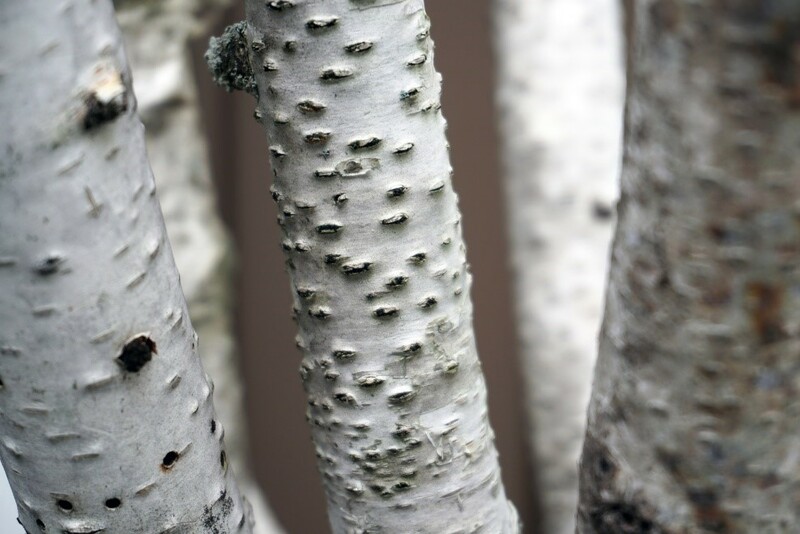 The bark of a gray birch starts out reddish brown in color and changes to a chalky white color as it matures. 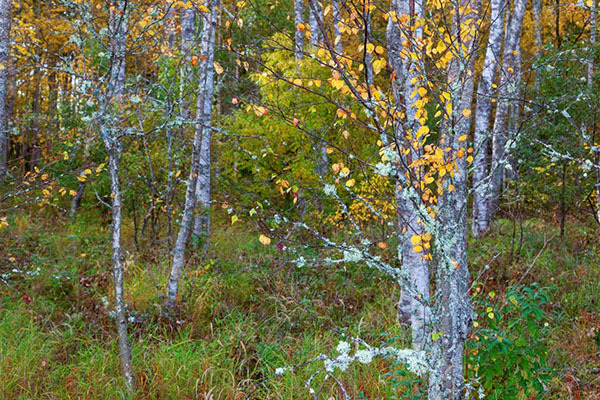 The bright green color of the leaves in the summer and vibrant yellow color of the leaves in the fall contrasted with the white bark makes the gray birch a uniquely beautiful tree. All species of birch trees are susceptible to insect infestations and diseases that can cause damage to the tree. The bronze birch borer is the most dangerous pest for birch trees as they can kill the tree if the problem is not immediately treated. It is very important for you to recognize the common signs of insect infestations and diseases on your birch trees so you can react to save the tree. Bronze birch borer: The bronze birch borer is the most destructive and lethal pest that attacks birch trees. These slender, bronze colored beetles lay their eggs on the birch bark and the larvae bore into the bark to feed on the sapwood inside. The larvae of bronze birch borers are slender and segmented and white in color. They will bore into the sapwood, creating tunnels in the wood and disrupting the sap flow. The tunnels underneath the bark are a major warning sign as well as a thinning canopy and the D-shaped exit holes they leave in the bark. These pests can kill a birch tree which is why prevention and immediate action are very important. Most birch trees are somewhat tolerant to the bronze birch borer if they receive proper care. Birch leafminer: Birch leafminers are small, dark colored sawflies that attack the leaves of birch trees. The adults lay eggs on birch tree leaves in the late spring and early summer, and the larvae feed on the inside of the leaves once they hatch. Birch trees affected by the birch leafminer will have green spots in the leaves early in the season that will turn into larger brown spots. This pest is rarely lethal to the tree, but it can weaken and damage the tree. Birch aphids: Birch aphids are small green aphids that feed on the sap or birch tree leaves. Leaves that are affected will become yellow in color and disfigured, and they may be coated in honeydew that is secreted by the aphids. Birch canker: Canker diseases are caused by a fungus that results in growths of dead tissue on the trunk or branches. The sites of canker sores are dark colored and may be covered with a sticky sap. It is possible for cankers to discolor bark and foliage and kill entire branches. Branches affected with cankers must be trimmed immediately to prevent the disease from spreading. If there are cankers on the trunk of a birch tree, the tree cannot be saved. Leaf scorch: Leaf scorch is a purely physical condition that is caused by environmental factors, not a virus, bacteria, or fungus. This typically occurs in hot or dry conditions in which the trees receive very little moisture and strong sunlight. Affected leaves will start to turn yellow and eventually become brown and withered. Leaf scorch does not uniformly affect the tree, it typically occurs in the areas most exposed to the unfavorable environmental factors. Heart rot: Heart rot is a fungal disease that attacks the inside of the trunk and branches and leads to wood decay. Hardwood trees such as birch trees are the most susceptible to this disease. Heart rot typically occurs when the fungus finds its way into the bark through an open wound. The most common sign of this disease is the mushroom like conks that form on the outside of the tree. The wood that is most affected is in the center of the tree trunk and branches, so it is possible for a badly affected tree to appear healthy on the outside. Planting: Birch trees have shallow root systems that thrive best in moist, cool soil. Make sure you plant a birch in an area where the soil will stay moist and cool and where the canopy will be exposed to sunlight. You should plant birch trees either in the spring or fall when the soil is cool and moist. If planting in the fall, make sure you do so 4-6 weeks before the ground freezes so the root system has time to develop. Watering: The shallow root system of birch trees makes them highly susceptible to drought like conditions. Make sure you water birch trees often to keep the soil moist, especially in the first two growing seasons after planting. Soak the area around the tree thoroughly when watering. Mulching: Mulching around birch trees is important because it helps retain moisture for the shallow root system. 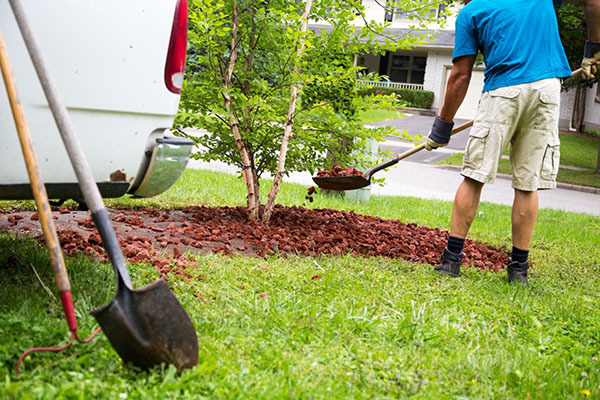 You should spread a 2-3 inch layer of mulch around the base of the tree. 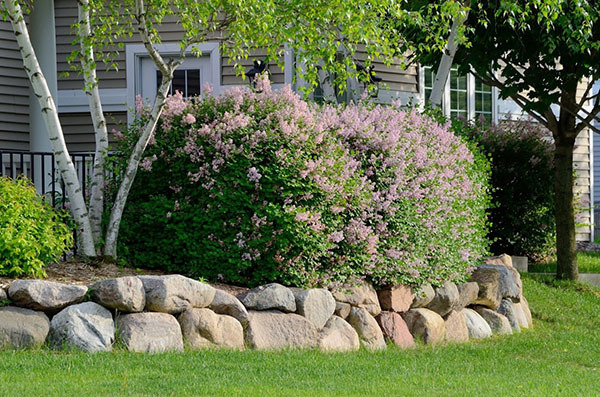 Fertilization: You have to be careful when fertilizing birch trees because too much nitrogen will increase succulent growth which will make the tree more susceptible to the bronze birch borer. Use slow release organic fertilizer with a low amount of nitrogen. Pruning: Effective pruning can help protect birch trees from pests and diseases. 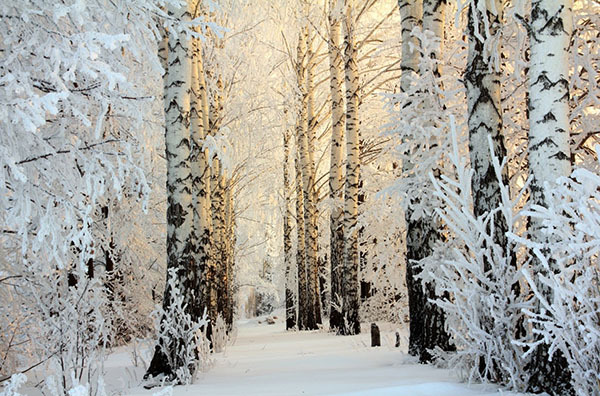 Birch trees should be pruned each year while they are dormant in the winter or late fall. Pruning them during the spring or summer will cause them to bleed sap which can make them vulnerable to diseases and attract bronze birch borers. It is important to remember that birch trees are sensitive to difficult conditions such as droughts and urban areas. With regular watering, mulching, and effective pruning, you can help keep your birch trees healthy and give them the best chance to resist diseases and insect infestations. If you need help providing proper care for your birch trees or if you think there is a problem with insects or a disease, you can enlist the help of professional arborists. The arborists of Hendricksen Tree Care can provide effective care and maintenance for birch trees in the Chicago area. We provide maintenance that includes fertilization and tree trimming to preserve the health and appearance of your tree, and we can also diagnose diseases and insect infestations and create an effective treatment plan. Our ongoing tree care program will ensure that our arborists will provide care for your birch tree when needed and take immediate action if they notice any issues. Hendricksen Tree Care provides complete tree care and maintenance services for the north and northwest Chicago suburbs including Northbrook, Arlington Heights, Highland Park, Wilmette, Mount Prospect, Palatine, and Glenview, IL. Contact us today for more information. Look for the next part of our continuing series about Chicago area trees.